Young people who grew up in Ontario's child welfare system are urging the province to reverse its plan to close the Ontario Child Advocate's office. "Without the provincial advocate, I could have easily become one of the youths who slip through the cracks," said one. 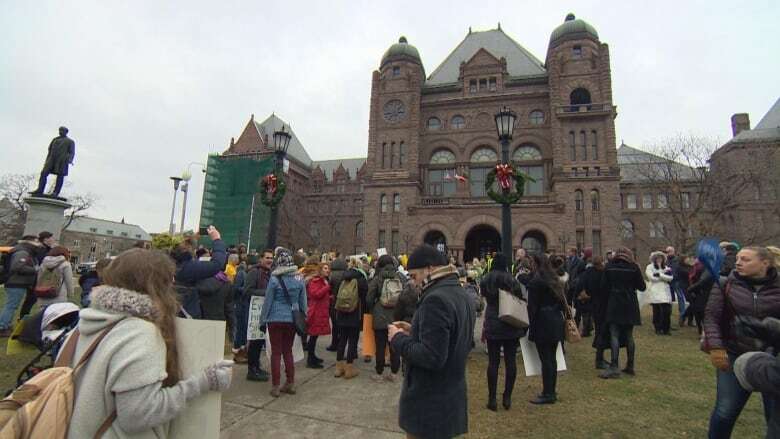 Young people who grew up in Ontario's child welfare system are urging the province to reverse its plan to close the Ontario Child Advocate's office. The PC government announced its intention to axe the office earlier this month in its fall economic statement, which included further slashing of spending and oversight. 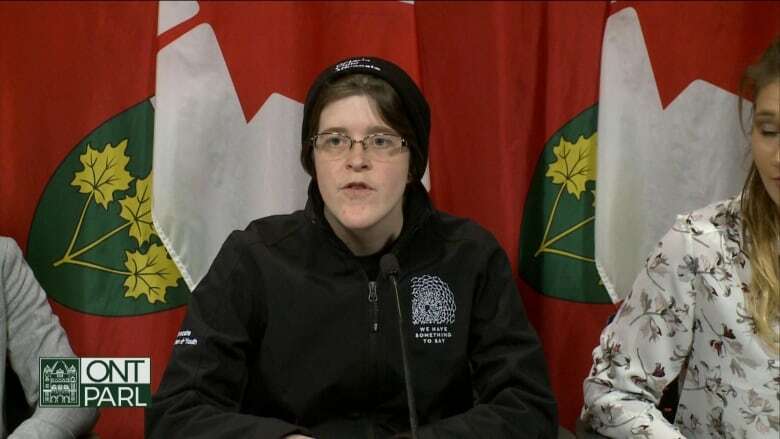 The plan was met with swift criticism from child welfare advocates, who took their message to Queen's Park with a news conference and rally Thursday. "It is a dark day for this province and its children when we balance a budget on the backs of the smallest of us," said Elsbeth Dodman, who worked with the advocate's office. "The advocate's office was a point of hope," she added. "The closing of this office is unconscionable." The Ontario Child Advocate serves as an independent watchdog to investigate ill treatment of children in the child welfare system and to review government policy and practice around services to children. The office was one of several casualties in the PC government's fiscal plan announced earlier this month, as the government attempts to cut down what it calculates as a $14.5 billion deficit. "The road ahead is not an easy one and will require difficult decisions," Finance Minister Vic Fedeli said after announcing the cuts. "I'm here today to let our premier know, on the behalf of youth in Ontario, we do not support a government that systemically institutionalizes us into believing that our voices don't matter," said Bailey Beattie, who suffered abuse during her time in the child welfare system. After bouncing around more than 40 placements, Beattie dropped out of high school and became a mother at 15. She credits the child advocate's office for helping her during that period, and now works as a youth peer mentor at the John Howard Society in Belleville. "Without the provincial advocate, I could have easily become one of the youths who slip through the cracks," she said. 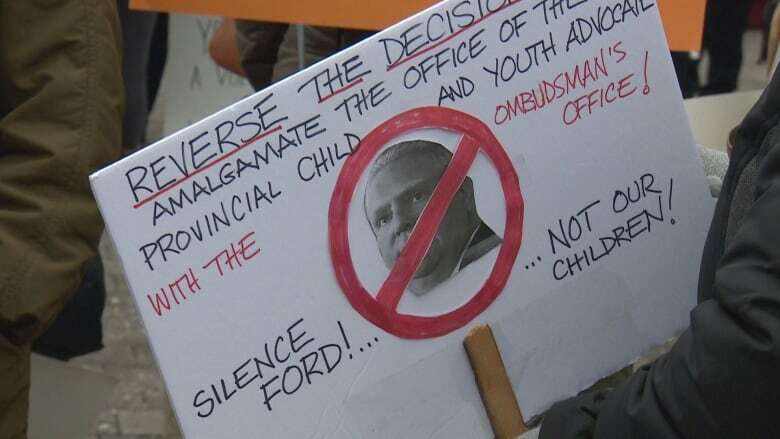 The Ford government has said the responsibilities of the Ontario Child Advocate will be handled by the ombudsman's office once the change is made. Children, Community and Social Services Minister Lisa MacLeod also defended the cut in the Legislature, telling fellow MPPs, "I can assure everyone in the legislature that the fiercest child advocate in this province will be me." That claim is also being challenged by youth with experience in the system. "It's kind of ridiculous to hear that statement. It's like she doesn't know what the advocate's office does," said Ashley Ash Thursday on CBC's Metro Morning. Ash grew up in the child welfare system and later worked in the advocate office for two years. She says Indigenous, black and disabled children will suffer disproportionately if the cut is made. "I'm frankly really worried for what we're going to see next for young people," she added.